We've got some big-name brands going toe-to-toe in Round 4, so there's sure to be some exciting outcomes. We're expecting some close matches, possibly an upset or two, and there's no telling who could win. The first three rounds of Mowers Direct's Mower Madness 2016 are complete, and the remaining mower brands are competing hard to make their way to the Finals. Many of the match-ups in Round Three ended in blowouts, but one match-up between Toro and Husqvarna kept everyone on edge, wondering who would win. In the end, Husqvarna ended up taking the win from Toro. The mower brands competing to enter the Finals are all great brands, so it'll be a close match to watch. Cub Cadet and defending two-year champion Gravely are battling to be the final team to rep the Bluegrass Division. Ariens and Husqvarna are battling to be the champion for the Bermuda Division, John Deere is facing Poulan Pro to take the Fescue Division, and Honda is up against notoriously tough Kubota in the Bent Grass Division. Jose Castellanos, Lawn Mower Expert at Mowers Direct, said, "We've got some big-name brands going toe-to-toe in Round 4, so there's sure to be some exciting outcomes. We're expecting some close matches, possibly an upset or two, and there's no telling who could win." Round Four of Mower Madness 2016 kicks off today and will continue for four days, ending on Monday, March 28. The remaining 8 lawn mower brands are separated into the following four divisions. 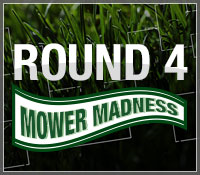 Visit http://www.MowersDirect/MowerMadness to vote in Round 4 of Mower Madness 2016.